The Philippine Calamansi Association, Inc. (PCAI) recently said that research and development (R&D) programs should address the declining production of calamansi in the country. This was raised recently in a meeting in Nueva Vizcaya. The meeting was held at Nueva Vizcaya State University (NVSU) with the university's experts, PCAI stakeholders, and the monitoring and evaluation (M&E) team of the Philippine Council for Agriculture, Aquatic and Natural Resources Research and Development of the Department of Science and Technology (DOST-PCAARRD). The meeting was held to monitor and evaluate the progress of the "Citrus Resources Research for Development in Cagayan Valley (CRR4DCV)" project sites in Nueva Vizcaya. 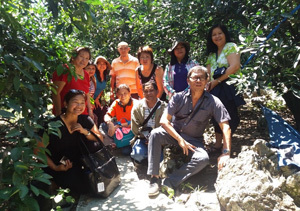 The PCAARRD-Crops Research Division (CRD) M&E team was led by the Industry Strategic S&T Program (ISP) Manager for Citrus Maria Adelia C. Belen. Roscelia M. Lambio and Nelia B. Laroza of the same division were members of the team. PCAI stakeholders emphasized that R&D initiatives should also focus on the lack of supply of quality seedlings and the declining fresh calamansi production. Ms. Helen del Rosario, President of PCAI, also reported the decreasing production of calamansi in Oriental Mindoro due to aging trees, shifting to production of other high value crops, and rampant conversion of calamansi farms into residential uses. To address these concerns, Ms. Belen advised the NVSU experts to collaborate with PCAI in packaging and submitting a proposal to DOST-PCAARRD. Dr. Jonar I. Yago, R&D Director of NVSU, mentioned that PCAI could aid in improving the status of the Calamansi industry in the country. Moreover, Dr. Elbert Sana, Program leader and Director for Citrus Resources Research and Development Center (CRRDC) of NVSU, presented the program activities, status, and accomplishments. Following the initial results of the Value Chain Analysis of Citrus in the province, project leaders agreed to focus on the conservation of citrus germplasm. PCAARRD, NVSU, and PCAI also visited the Satsuma Farm owned by Mr. Jessie P. Lammag, Satsuma grower-cooperator at Barangay Cabuluan, Villaverde, Nueva Vizcaya. Lammag showed the production system of satsuma and discussed the technologies he adopted in his farm. Aside from the farm visit, the team visited and evaluated the condition of the tissue culture laboratory, citrus genebank, and processing facility of NVSU.